Under the thematic banner of "Fueling Interactive Advertising's Creative Revolution," the Interactive Advertising Bureau (IAB) convened top talent for NYC's Advertising Week "to articulate their visions for unleashing the full power of digital media." 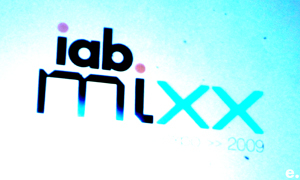 If it comes as no surprise to industry insiders, presenters at IAB's MIXX Expo confirmed that the vision of advertising's future is now squarely focused on social media. "Today we need to find an audience, entertain them, and measure them," said Steve Wax of Campfire -- an agency that later won 4 IAB interactive advertising awards. "We have to stop making old things in new places ... we have to stop thinking only [return on investment] and be historic," said Colleen DeCourcy, Chief Digital Officer of TBWA Worldwide. Click to view a photo set of presenters and information slides from MIXX. 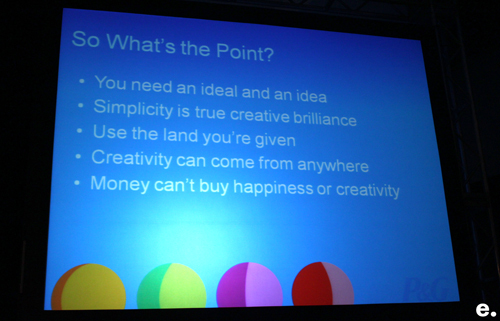 Toadstool's Alan Wolk sees six common obstacles to social media success. 1. Luddites: Those who still think social media is a fad. 2. Magpies: People who believe any social media effort will work. 3. Lawyers: Those who require too much process for approving social media content. 4. Hogs: Staff who won't provide cross-departmental content to repackage for the web. 5. Misers: Those who think social media is free. 6. Lousy products: Transparency in social media exposes user dissatisfaction with poor products. 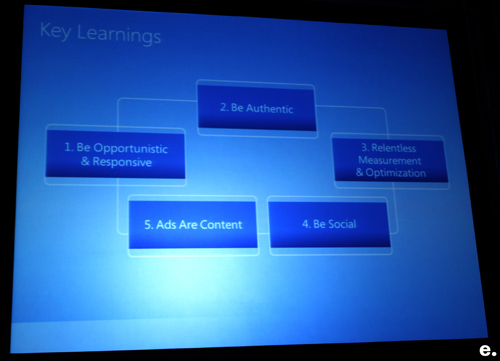 Senior Microsoft VP Yusuf Mehdi offers 5 lessons for success on the social web. 1. Be opportunistic and responsive: Ashton Kutcher beat CNN to a million Twitter followers by seizing the chance to be the first, and actively engaging with his audience. 2. Authenticity: The million dollar home page worked when its purpose was authentic -- to raise money for a student's college tuition. When it was redone to raise money for the student himself, it flopped. 3. Relentlessly measure and optimize metrics: Zappos built its new brand and sold over 400,000,000 pairs of shoes by capitalizing on search marketing that relied on interest in previously established brands to drive sales on the Zappos website. 4. Be social: Starbucks' My Starbucks Idea effectively engages Starbucks' customer community in a direct conversation with the brand. 5. Ads are content: Burger King has seen incredible marketing success by turning content into commercials -- like the Whopper Freak Out videos, and the infamous Whopper Facebook Friend sacrifice. Proctor & Gamble Digital Business Strategist Lucas Watson has four-part advice on getting great creative content. 1. Have an ideal and an idea: "When advertising is driven by a higher calling -- a higher sense of purpose -- that's consistent with the brand's equity, we get amazing returns in creative," said Watson. 2. Use the land you're given: Context matters. "Ads are viewed in the context that the creative is delivered," Watson says -- not as stand-alone elements. 3. Creativity can come from anywhere: 30,000 submissions from 108 countries were received by Hugo Boss for their new cologne advertising campaign. The winner was an 18 year old from Thailand. 4. Keep it simple: Pringles recent online ad campaign deliberately featured a stripped-down, simple graphic layout to keep the focus of the ad. Casale Media's Scott Steiner showed the do-s and don't-s of online demographic targeting. 1. Don't use census based demographic targeting. Zip code targeting is an imperfect science, and geographic demographics move too quickly to measure for digital advertising. Plus, it's impractical as it doesn't target sub-groups within geographic areas -- making it impossible to target based on gender, or reach minority groups within a specific location. 2. Don't use offline studies to predict online interest. The time required to process data and apply it to online advertising takes too long given rapid shifts in the online marketplace. 3. Casale's system is "smoothed sight-level demographic intelligence." A rolling 3 month window of a specific website's use statistics gives an accurate view of overall trends in user behavior. The method uses real, up-to-date info unique to a specific website. The data matches actual user behavior, not how users might act. 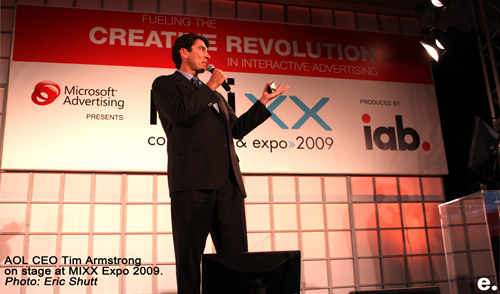 AOL CEO Tim Armstrong sums it up with a five-point bet he's willing to wager the company on. 1. The recession has created large white space for advertising on the web. 2. Users are allowing distribution to become more targeted. Sites like Facebook and Hulu allow users to choose, rate, and even reject on-screen advertising. 3. Content always trails distribution. Creating good outlets for distribution will attract quality content to follow. 4. Future content brands start now. 5. Content management systems are the new ad systems.